Avid, the makers of Pro Tools, have just announced the release of Pro Tools 12.7, the newest version of their award-winning DAW. Pro Tools needs no introduction, it's the industry-standard digital audio workstation that provides everything you need to compose, record, edit, and mix music and audio. Proven and trusted by professionals in every segment of music creation, movie making, television, live sound, broadcast, and streaming media, Pro Tools enables you to expand your creative possibilities and opportunities and maximize efficiency, so you can deliver the best sounding mixes possible. And with Pro Tools 12.7, it’s easier than ever to create with powerful new loop workflows and a freshly curated 2 GB loop library from leading producers. Explore and experiment with new creative ideas and collaborate with ultimate fluidity using Project Revisions. Share tracks with anyone, anywhere. Collaborate with songwriting partners, bandmates, friends, colleagues, and amazing talent—no matter where they’re located. Edit audio faster and easier. Elevate your sound to a new level with an incredible collection of plug-ins and instruments. And get Pro Tools or Pro Tools | HD your way. Create with a low-cost subscription. Own the software or a complete system outright. Or get started with Pro Tools | First, a completely free version of Pro Tools. The choice is yours. Need to find that perfect beat, groove, style, or sound for your project? Soundbase makes it a snap to browse, search, audition, explore, and experiment with loops, samples, and sound effects from nearly any sound library. This new Workspace pane provides customizable tag filtering, so you can find what you need quickly. Search your library by instrument, genre, tempo, key, time signature, and your own tags. And hear how content sounds in sync with your tracks. Get access to the latest loops created by the industry’s leading producers and sound designers. Pro Tools now comes with a 2 GB high-quality loop library from Loopmasters to wake up your mix and give projects that sonic edge. Whether you need a rhythm section, a cool riff, instrumental accompaniment, or just something to help you get started, you’ve got hundreds of mini musical works, waiting to be discovered. And it’s easy to find and audition loops with Soundbase. Wish you could try out something creatively, but easily go back to a previous version of your project if you change your mind? Now you can. With Project Revisions, you can explore new versions of a song or soundtrack, make notes, share ideas with others, and quickly jump back to any previous state from anywhere—without having to worry about breaking anything. That’s because Pro Tools keeps all version history, audio and video files, notes, and other data organized for you. 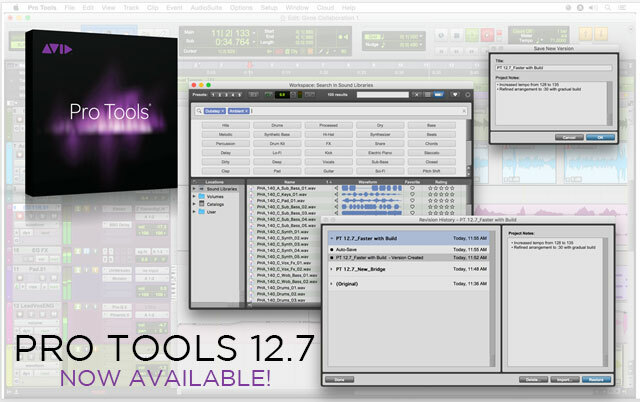 Shop Pro Tools now from RSPE to get access to all of these features and much more!